Beistle 60695 Card “Suit” Boppers. One size fits most. 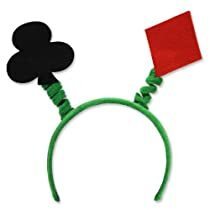 This card themed bopper features a black club and red diamond attached to a green fabric covered headband. Wear these boppers at your next casino themed party and receive some compliments!.